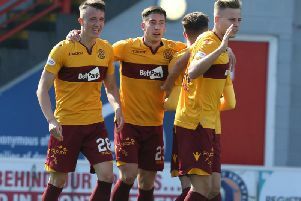 Motherwell played out a hard fought goalless draw against Dundee in a Scottish Premiership clash at Fir Park on Saturday. m ‘Well, keen to build on the previous week’s encouraging display at Ibrox, started promisingly enough and Marvin Johnson and Joe Chalmers – who retained his place ahead of fit again Stevie Hammell – had early efforts off target. Dundee skipper Darren O’Dea then required treatment after being poleaxed when the ball rattled into his face after a fine strike from outside the box by impressive Motherwell midfielder Craig Clay. Steelmen centre half Stephen McManus then looped an 18th minute Chalmers corner from the left into the net with his head but the ‘goal’ was ruled out for an infringement by a ’Well team-mate in the penalty area. Dundee’s first chance was a very good one, with forward Faissal El Bakhtaoui - a summer transfer target for Motherwell - ghosting in too easily before having his shot saved by home goalkeeper Craig Samson. The ball rebounded back to El Bakhtaoui but his second effort was brilliantly blocked by ‘Well defender Ben Heneghan. Scott McDonald’s rasping shot at the other end then went just over the Dundee bar on 28 minutes. Although ‘Well forced a succession of corners and Chris Cadden made some promising runs down the right, the first half ended goalless in a 45 minutes in which ’Well were superior. But whatever Dundee gaffer Paul Hartley said to his troops at half-time – I think it would have been slightly stronger than ‘I say chaps, let’s bally well do better’ – had the desired effect. Dundee gained the ascendancy early in the second half and Michael Duffy shot wide during a spell of pressure from the Dark Blues. But ’Well momentarily awoke from their slumbers on 56 minutes when McDonald’s 20-yard shot was saved by Scott Bain before Johnson’s rebound attempt was blocked. El Bakhtaoui and Duffy both failed with goal attempts for Dundee before the hard working McDonald set up Lionel Ainsworth at the other end for a fine shot which was saved by Bain high to his left. Johnson – who will reportedly be staying at Motherwell beyond the summer transfer window – forced Bain to make another save after a fine one-two with Clay, before ‘Well assistant boss James McFadden was brought on as a sub for Ainsworth in one last throw of the dice but Faddy couldn’t inspire a winner.